On the 21st of April celebrate Easter with us with the great egg-scape! Murder Mystery Club is glad to present the first mystery for kids! 110RMB per person including one panini and one drink. Game is for kids 6-14 years old only. On the 21st of April celebrate Easter with us with the great egg-scape! Murder Mystery Club is glad to present the first mystery for kids! 110RMB per person including one panini and one drink. 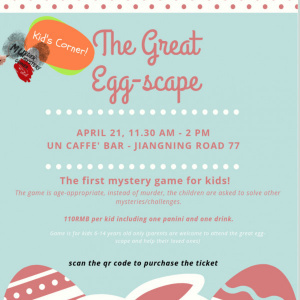 Game is for kids 6-14 years old only (parents are welcome to attend the great egg-scape and help their loved ones). This is a game where the kids will play work together to solve challenges, puzzles, etc. to "escape" - or in this case, unlock their Easter basket/goodies - before a set time. There are 4 rounds of challenges in this game. The challenges in this game are all age-appropriate and Easter-themed. The event is open to a minimum of 20 and a maximum of 40 kids.